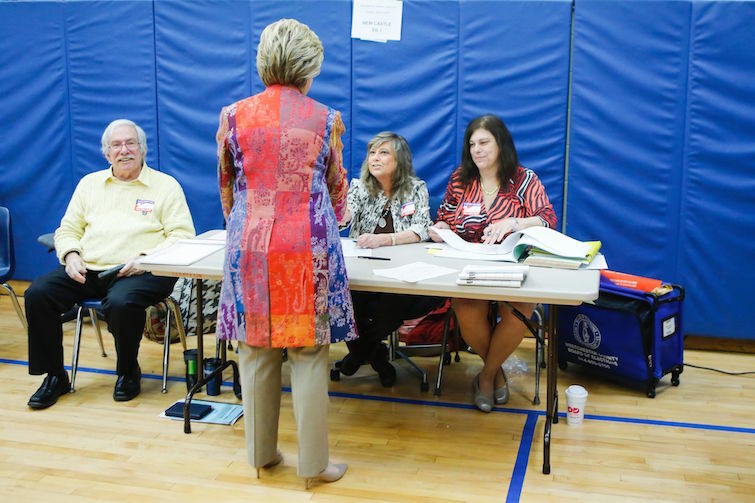 On the day before New York's primary, Hillary Clinton was photographed in a royal blue pantsuit, wearing it to a rally and while eating ice cream (and booing someone who asked her how many calories were in it). 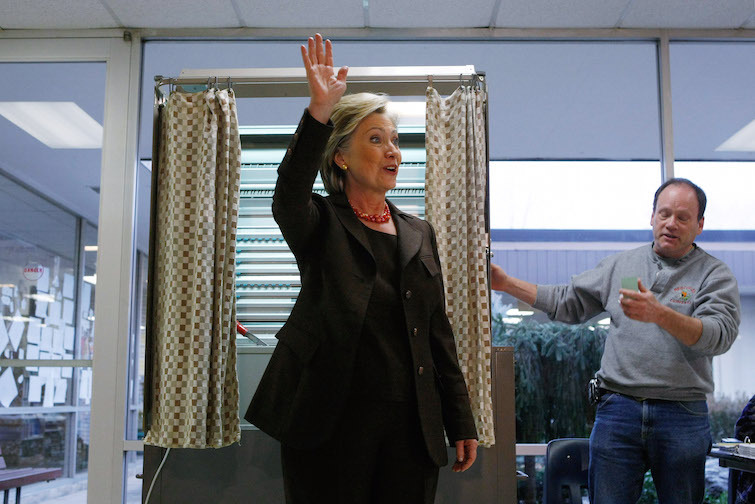 Overall, it was predictable, given that she is nearly synonymous with the color-coordinated pantsuit. 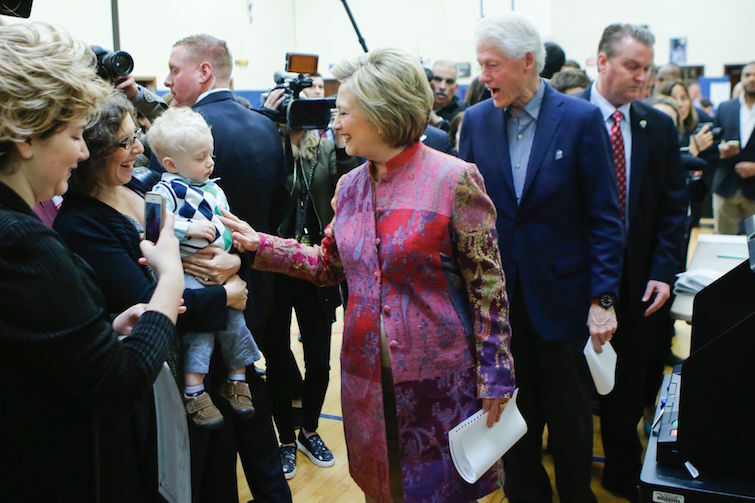 But then Tuesday struck, and Clinton's technicolor dreamcoat was born. It was pink and purple and blue and red and orange and yellow and green all at once. It shone in the sun. It flared at the knee. She paired it with neutral pants and kitten heels to highlight just how bright this coat of perhaps too many colors really was -- and, coincidentally, how far she's come in terms of fashion. The buzz on Tuesday was that Clinton would win, and she did. The coat was, prior to her victory speech, a way of setting the tone for the day -- one of unity and multicultural pride, which is coincidentally one of the many elements that aided Clinton in her win. 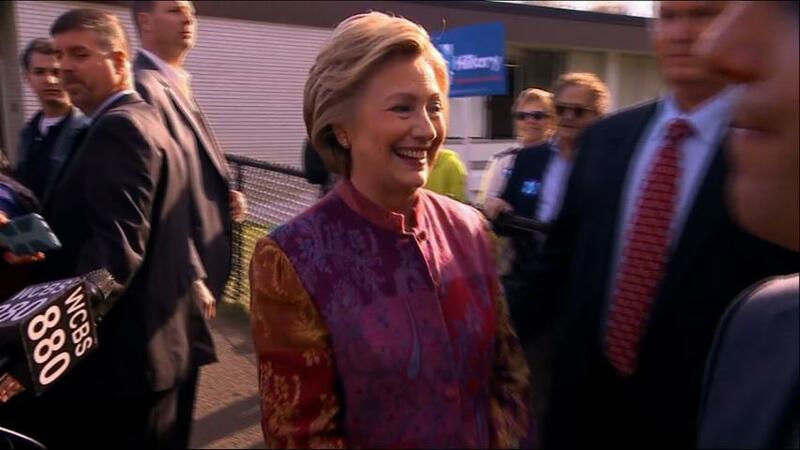 The coat was Clinton's way of saying that she knows she's in a good position to take the election, and she wants to. With the numbers now widely in her favor, Clinton is on the path to the general election and maybe even the White House. That, in turn, has affected her fashion for the better. The difference is startling, isn't it? A brown suit. A basic. Something that made absolutely no headlines. 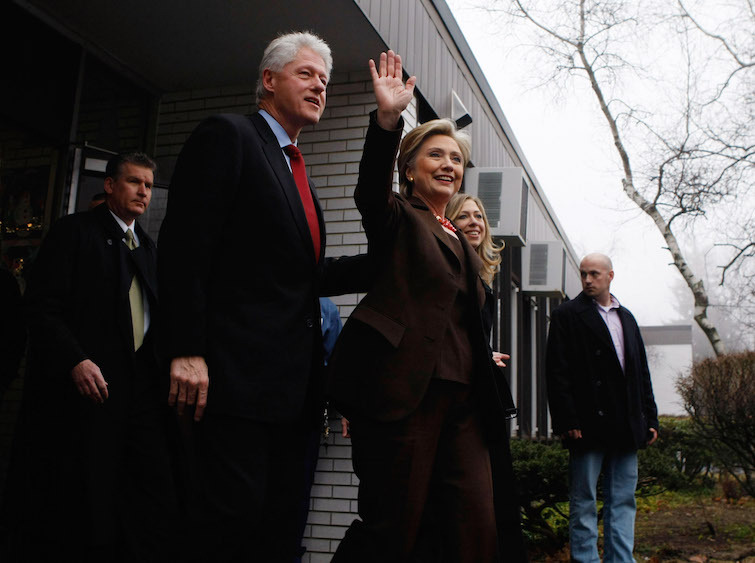 At that point, Clinton likely knew that she'd probably get New York (and she did), but things were less optimistic for her in the long run, and it was only just February. The gap between her and Barack Obama was narrowing, and she still had a number of tough states to win. A most colorful Hillary. She didn't have to go with a basic solid blue or red suit on Tuesday. She knew that making headlines (or even just a flurry of funny tweets) wouldn't scratch her. She could, at last, take a risk. And as a woman, that speaks volumes. Given how critical the media is of female politicians, the fact that Clinton made such a bold move on such a highly-covered media day showed unbothered confidence. Prior to this, she's already faced criticism for her fashion and her hairand her makeup. But now, with victory within reach, she didn't give a rip about those critics. Really, she's acting more like she's in on the joke. A mauve coat that, with woven white embellishments, appeared pink. A twist on Chanel. It had texture. It was, admittedly, not the most flattering, but it felt like something Clinton would wear, and that's important as she carves out a style on her own. 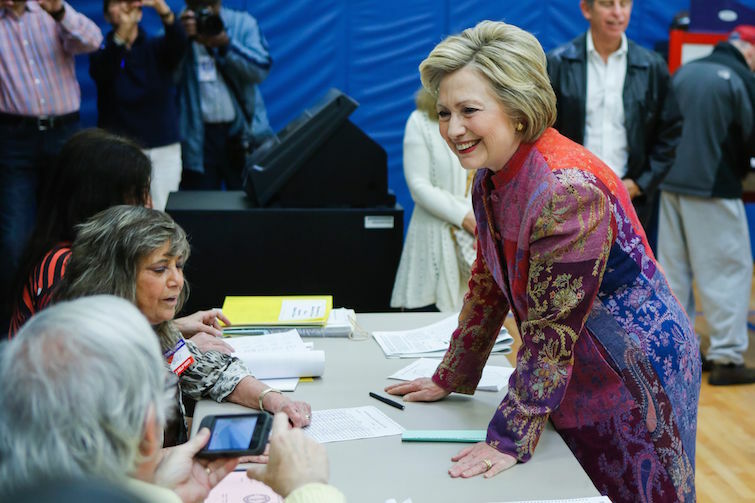 The most notable garment Clinton's worn on the campaign trail thus far was during a debate, and it was a bright yellow satin jacket that didn't go over so well. Now, with New York overwhelmingly on her side, she leapt towards pink. 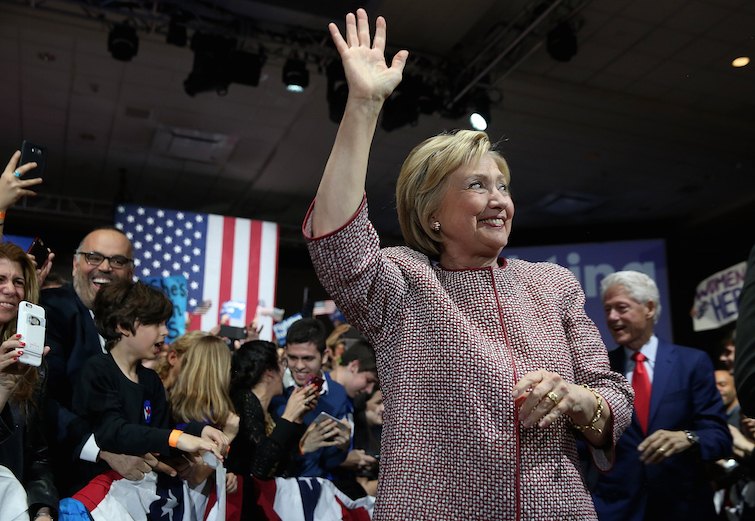 At last, comfortable in this role of presidential hopeful, Clinton is having fun with fashion. So, consider yourself living in a new era for Clinton. Things are getting a lot more interesting -- and colorful.